NETGEAR, the leading provider of networking devices; that powers today’s smart homes showcased its most admired flagship product, the Nighthawk Pro Gaming Wi-Fi router (XR500) at IGX Mumbai. The event witnessed a huge footfall of gamers where they got a chance to try out on the latest and most popular games and software. The groundbreaking NETGEAR Nighthawk® Pro Gaming WiFi Router (XR500) leverages advanced cutting-edge software to optimize network connections by stabilizing ping, reducing lag spikes, and keeps you always on with reliable wired and wireless connectivity for advanced online gameplay. The Gaming Dashboard, Geo Filter, Quality of Service (QoS) and Network Monitoring capabilities enable customization and gaming performance unmatched in the router space. 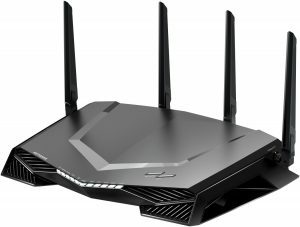 NETGEAR Nighthawk includes best-in-class hardware features such as a dual-core 1.7GHz processor, Quad-stream Wave 2 WiFi with MU-MIMO, and four external high-power antennas wrapped up in an aggressive and formidable enclosure. Whether you’re gaming online, hosting a LAN party, or streaming high-definition content, the new NETGEAR Pro Gaming product will take your network to a whole new level of speed, performance, personalization and control. Gamers tend to look for every advantage to maximize their ability to thrive in their online game of choice. Regardless of whether one is a serious or casual gamer on either a console or PC, the Nighthawk Pro Gaming Router XR500 and will give you greater command over who you play with and prevent unwanted interruptions giving you the ability to level up your gameplay. “We are extremely pleased to be a part of the IGX 2018 to show our exceptional gaming product range. At NETGEAR we have worked tirelessly to deliver best-in-class performance, customization and ease-of use for the ultimate gaming experience. We will continue to participate in such strategic events which give us an opportunity to set new standards in the gaming segment”, comments Mr. Marthesh Nagendra, Country Manager – India & SAARC, NETGEAR. With the new Nighthawk Pro Gaming WiFi Router, one can enjoy lag-free online and network gaming. Its MU-MIMO WiFi streams simultaneously to multiple devices on the same network so you and your pals can smoothly game online at the same time without affecting each other’s performance. ·Gaming Dashboard — on a single screen, views real-time bandwidth utilization by the device, ping delays, and many other parameters. ·Geo Filter — Fix your gaming lag by limiting distance to servers or other players, get a guaranteed local connection, and create black/white lists of your preferred servers. ·Quality of Service (QoS) — Prioritize gaming devices and allocate bandwidth by the device to eliminate lag due to queuing at the ISP network. ·Gaming VPN — Protect your network identity, prevent DDoS attack, and use the VPN client to connect to the VPN server. ·Network Monitor — Check on bandwidth-hogging devices and identify the applications which could be causing lag. ·Gigabit Ethernet Ports — Maximize speed with four (4) GbE LAN ports for wired connections, ideal for fast-paced gaming and high-quality streaming. ·802.11ac WiFi — Enjoy Multi-User MIMO (MU-MIMO) for simultaneous streaming, Quad-Stream and 160MHz for faster speeds. ·Dual-Core 1.7GHz Processor — Support more devices for better 4K streaming, VR gaming, surfing, and more with this powerful, faster processor. ·AC2600 WiFi — Take advantage of up to 800+1733 Mbps* wireless speed, and double the available bandwidth with simultaneous dual-band WiFi. ·High-Performance Antennas — Get better WiFi coverage and faster speeds with four (4) external antennas. ·Memory — Enjoy plenty of headroom with 256 MB flash and 512 MB RAM. ·Beam forming+ — Enjoy more reliable connections for fewer drops, providing jitter-free network performance.